Github pages is a platform for you to publish a static web page about your open source project(s) on Github. For example, my Github username is yanhan, and the project name I’ve showed above is algo_ghackers, hence the url. Notice that alongside the master branch, there is a gh-pages branch. 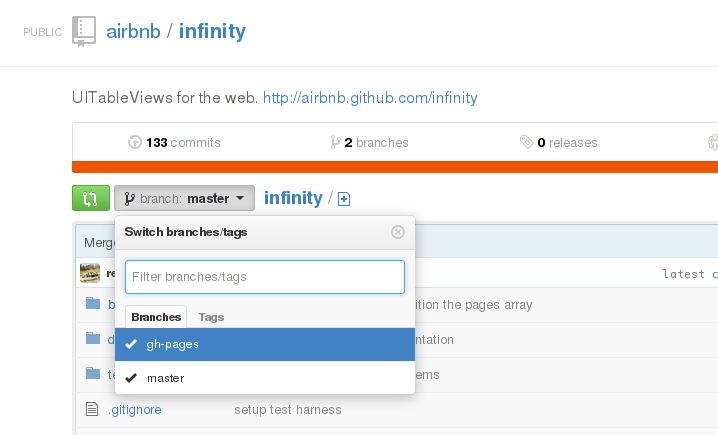 In fact, the contents of the gh-pages branch of Infinity.js is exactly what is used for its Github Pages webpage at http://airbnb.github.io/infinity/. This applies in general for all Github projects. The below information is obtained from the official Github Pages documentation and this tutorial from almost 3 years back, along with some experimentation. This will create an orphan branch called gh-pages. Based on the git-checkout manpage, the first commit on an orphan branch has no parents, so it is disconnected from the history of your repository. This is perfect for our use case, after all, the history of the source code of a project probably should not feature as part of the history of its github page. Again, this step may be optional depending on what you are trying to do. This means adding at least an index.html file, and more commonly the whole set of static content you want to display on your project’s Github page. Refer to the Github pages official documentation for more details. Do not forget to make a commit when you are done. Adjust the remote name accordingly if it is not origin. “Are you trying to publish one?” It may take up to ten minutes until your page is available. In the meantime, just relax.